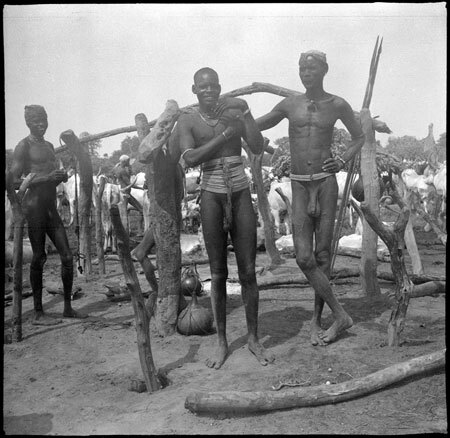 Several Mandari Köbora youths wearing a number of rem waist beads standing next to a construction of posts crossing what appears to be a well, with gourd containers nearby. Morton, Chris. "Mandari youths at cattle camp" Southern Sudan Project (in development). 03 Jan. 2006. Pitt Rivers Museum. <http://southernsudan.prm.ox.ac.uk/details/1998.97.316/>.